In January of 1988 the friends of Ned Huffman, and his late wife Ruth, established a fund to honor Mr. Huffman at his retirement from the Research Triangle Foundation, and to recognize his long-standing commitment to the College of Veterinary Medicine and the North Carolina Veterinary Medical Foundation, Inc. The Award is designed to recognize in a faculty or staff member the qualities of leadership, vision, and achievement that Mr. Huffman values highly and his career exemplifies. 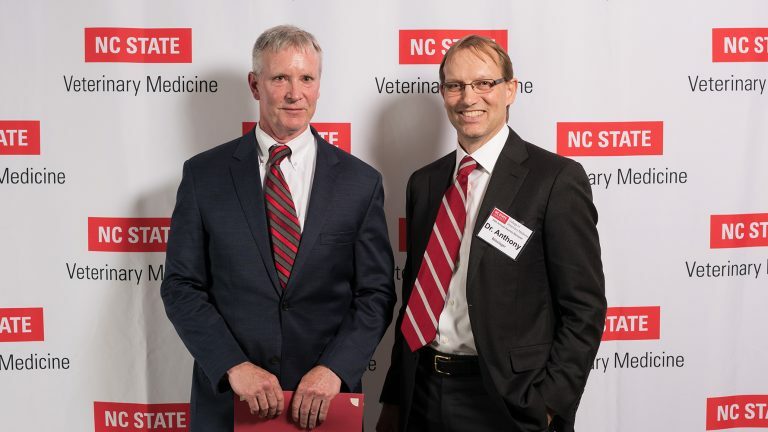 2018 Huffman Leadership Staff Award recipient Jim Brawley, Hospital Administrator, with 2017’s winner Anthony Blikslager, Professor and Service Chief, Equine Medicine and Surgery. Not pictured, Brian Gilger, who won the Huffman Leadership Award for faculty. Candidates for the award must be faculty or staff members who have made an outstanding contribution to the College of Veterinary Medicine, its people and its programs. In addition, the individual must have demonstrably affected the quality of teaching, research, and public service of the College. The candidate must possess the highest qualities of leadership, be entrepreneurial, be an astute problem solver, and be innovative in the development of improved and new programs. A committee composed of the following members will receive, review, and select the award recipient. The dean, the president of NCVMF, the college faculty secretary, the chair of the faculty scholarship and awards committee, a student, and the college director of development. The committee will consider all nominations submitted and may itself nominate candidates. Nominations will be accepted until Friday, March 29, 2019 and will automatically carry forward for one additional year. If an individual is judged worthy, his or her name will be announced at the spring awards banquet. A cash award of $1000 will be presented. Co-Nominators: List two persons who will corroborate the nominee’s qualifications.